VIDEO: Watch another Top Ten finish for driver JR Hildebrand and the Panther Racing Team as they battle through the aggressive Honda Indy Toronto. 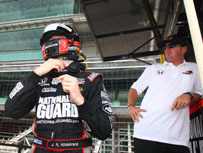 Watch another Top Ten finish for driver JR Hildebrand and the Panther Racing Team as they battle through the aggressive road course at the Honda Indy Toronto. All Contents © copyright Panther Racing, Inc., 2011 All rights reserved.